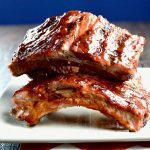 This Fall off the Bone BBQ Ribs Recipe will amaze you at how simple and how little time it will actually take you to make them. Seasoned with just a few ingredients (a dry rib rub below or try this homemade Cajun Seasoning Recipe for a little kick.) These grilled baby back pork ribs work with or without sauce! This easy BBQ ribs recipe are ideal for entertaining– you can spend about 15 minutes prepping the ribs, and then put them on the grill to cook. More time with your company and very little clean-up. Sounds like a win/win in my book. The first tip when cooking ribs is to always remove the silver skin membrane. Take a knife and lift up the membrane at one end on the bone side of the ribs. If you use a paper towel once you start to pull it up it will come up super easily. You can check out this video from Barbecue Tricks to see the exact way to do it. By removing that silver skin membrane the rub will penetrate both sides of the meat; it also removes that tough to chew piece from the tender meat so it allows for the ribs to come to the full tenderness they should be. Rub the dry rub onto both sides of the ribs to add flavor to every bite. Grilling on indirect heat at a low temp for a longer time also adds to the tenderness; the ribs breakdown, but don’t dry-out and get burned by being on high heat. Grill the pork ribs on indirect heat. Turn on the burners to low heat. If you have a large grill, turn on the two outer burners and then set the ribs on the section where there is no flames. If you have a smaller grill, heat one side and leave the other half off. You may need to move the ribs if its a smaller grill more often to avoid having the ribs be over the flame. How to grill ribs on a charcoal grill? You’ll set your charcoal only on one side and let them get super hot, then allow them to get to medium/ low heat before placing the ribs on the non heated side. Because it takes 2-3 hours to grill the ribs, you may need to add some coals to the bbq. You’ll need to pay special attention that the grill does not get too hot. 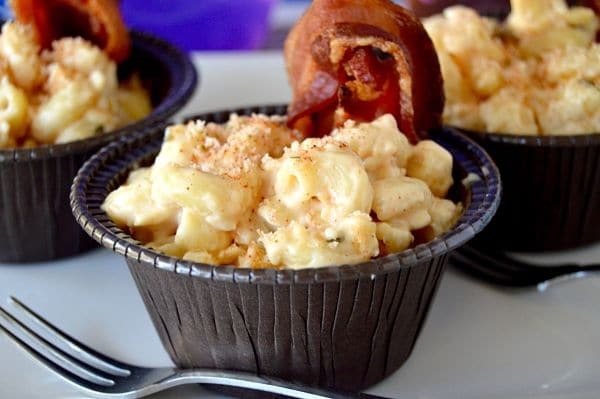 Follow me to get ideas to have for making easy delicious meals & appetizers for stress free entertaining! Serve these with or without sauce. The sauce goes on at the very last minute, if you put the sauce on too early, the sugar will cause over browning/burning. 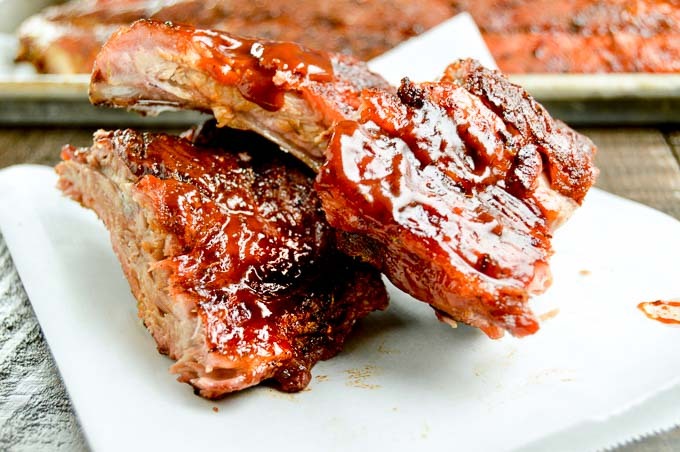 I’ve included a recipe for a tangy BBQ sauce which you can make while the ribs are cooking, but if you just don’t want to go to the effort, just buy your favorite store-bought one and brush them on in the last 15 minutes of cooking. 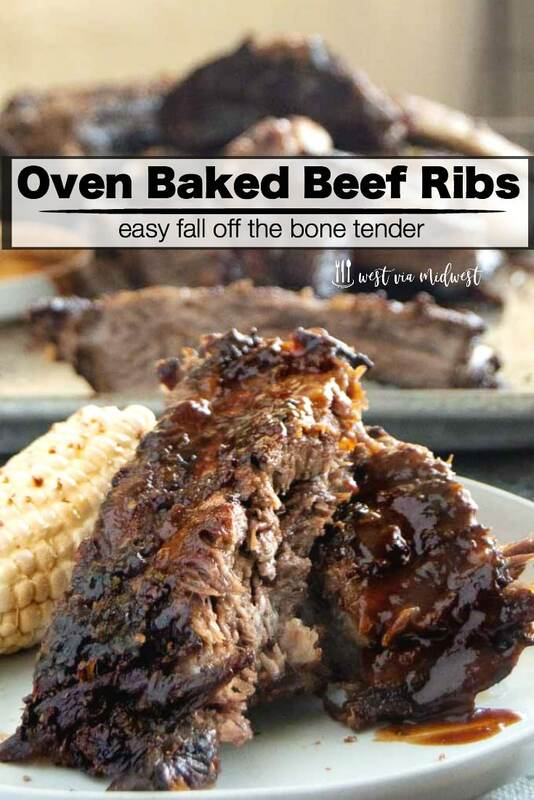 Alternative to grilling them ribs can be made in the oven. Bake at 275°-300° for 3- 3 1/2 hours. Lemon Blossoms also has an excellent recipe for BBQ Ribs in the Oven with Bourbon Peach BBQ Sauce or a simple dry rub for Beef Ribs Recipe here! Craving more recipes for BBQ’ing or entertaining? — sign up for my mailing list here at the bottom of the page. or PIN THIS TO YOUR Grilling Board or Party Food Board for when you are looking for ideas to serve to entertain! Grilled low and slow yields Fall off the Bone tender BBQ Ribs, brush with a tangy bbq sauce for lip smacking deliciousness. 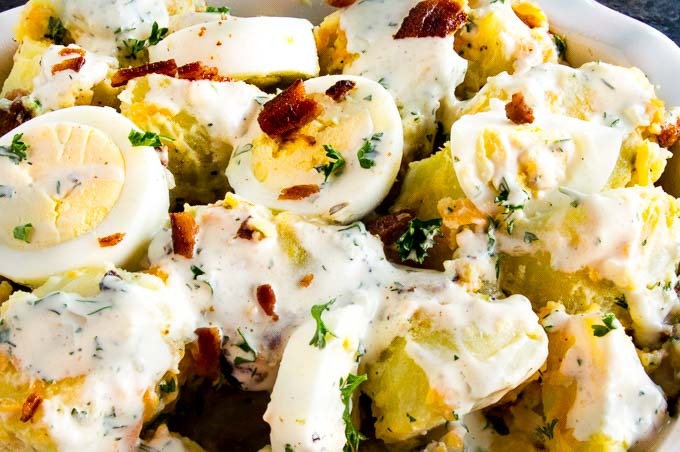 Perfect for summertime entertaining! Turn on grill to medium-low , about 275°. Rinse ribs and pat dry with a paper towel. Remove membrane on back of each rack of ribs. Slide a knife in at top under membrane and use your fingers to pull away. Then use a dry paper towel to hold membrane and pull it all of the way back and remove completely. In a small bowl mix seasoned salt, pepper, garlic powder, paprika and cayenne and mix well. Then sprinkle generously over both sides of ribs. Using your fingers rub the spice rub into ribs to coat well. Using the off-heat method cook ribs. If your grill has five burners, turn on the outer 2 burners, and leave off the three middle ones. If you only have 4 burners, then turn on two on one side, and leave the other two off. You will place the ribs bone side down onto the non flame area of the grill. (No need to flip them during grilling. Place ribs meaty side up on the grates over the burners that are OFF. Close the lid, and check the ribs periodically to make sure they aren't burning at the point where the tips may be over a burner with a flame. As the ribs are cooking they will start to shrink a little, so if they are slightly over the flames, as they cook, move them away from the flame. While the ribs are grilling, place all ingredients for the tangy BBQ sauce in a small sauce pan and stir to mix completely. Once mixed together, turn on heat to high to bring to a boil. Once the sauce is at a boil reduce heat to medium and continue to cook for 30 minutes until slightly thickened. Serve brushed on the ribs or as a side to be applied as needed. If cooking in the oven, do you need to foil wrap? I made these ribs and they were super tender and finger licking good! 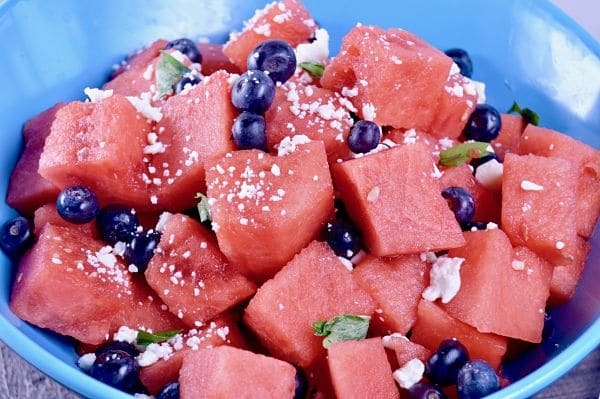 Will be making then all through the summer! Oh my goodness these look amazing! 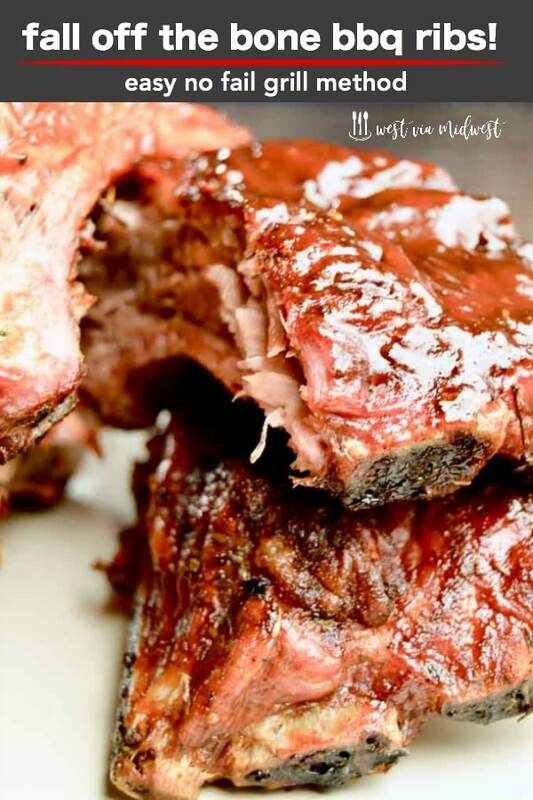 This is my favorite kind of rib recipe! 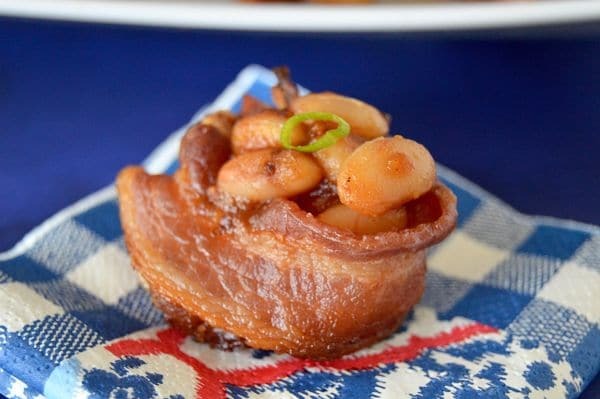 I made these at the weekend and they were exactly as you described….fall off the bone. You will have to watch it pretty carefully. Id be sure and cook them on low and check them often. Its totally possible to do them on the heat, Ive done it but you want to make sure they dont burn and get too dried out… hope that helps. Oh… Id also put a piece of foil down between the grates and the ribs to catch the fats that will release… that will cause flare ups… be careful to not burn yourself in the grease…. For the last 15 minutes you can remove them from the foil and cook them on top of the grates to let them dry and char a little! Do you need to turn the ribs at any point ? 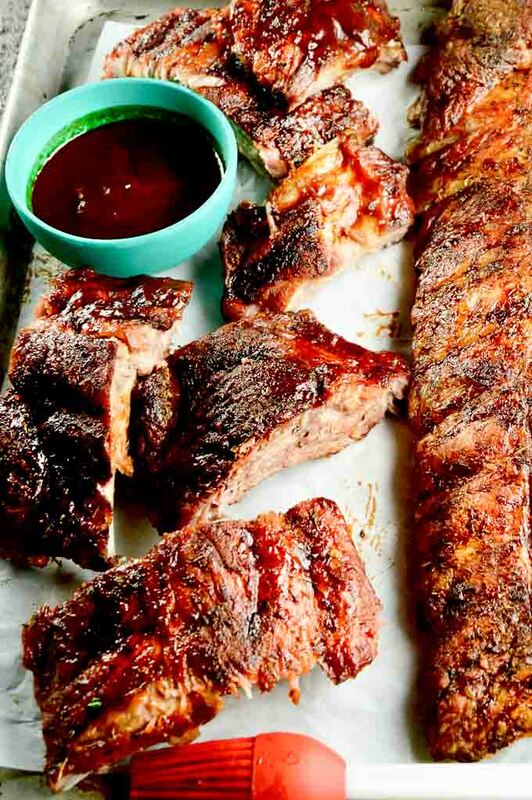 Our kids love ribs and these look simple and delicious, just the way their dad loves them too! Thanks for the great recipe! Do you ever put a container of water in the grill to keep them moist? Or is it not necessary? I’ve just gotten super interested in grilling, and you’ve given such great tips here! Thanks so much Michele! 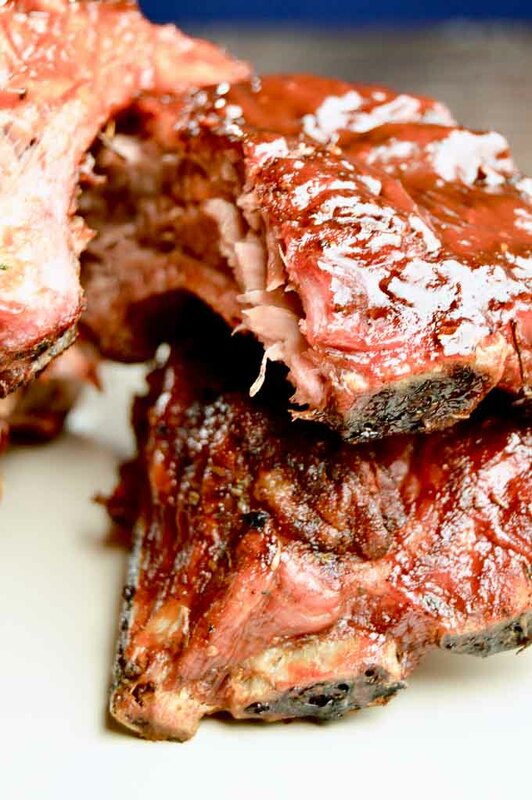 These ribs are sooo tempting, will certainly make them at my next bbq gathering! I have never actually made ribs at home. These look amazing so I’ll have to try your recipe! Jill… they are so easy to make, and basically set them and forget them I hope you get a chance to make them! Will it hurt if you wrap them in foil before you put them on the grill, as my grill runs hot and it keeps the grill cleaner. Removing the silver skin is very important — it really does let the rub penetrate the meat and besides, noone wants to chew on that… These ribs look amazing. I’m ready to make them! I’m not really into ribs, but my boyfriend looooves them. Fall-off-the-bone meat with loads of juicy sauce – this looks like the kind of thing he’d really love! These look legit enough to be found at a BBQ joint in Texas! I like them with just the dry rub and sauce on the side. The fact that the indirect heat does all the work for you is an added bonus.